Happiness. How can you define it? What is it? Why is it so important? These are things i’ve been asking myself since going to Bhutan (the kingdom of Happiness) over a month ago. It seems everyone’s pursuit for happiness leads them on a different path, often with highs and lows, deep connections, disappointments, new motivations, heartbreak, love, passion, desire, enlightenment and so on…this is the journey of life, right? So why do we find it so difficult and challenging to be truly happy? Why is it such a big question? ..and what does happiness truly mean? I hadn’t really heard of Bhutan before coming across the Slow Change Experience and I had never heard of Gross National Happiness (GNH) as a way to govern a country. I read about this awesome program and I knew I would try my best to get accepted. The experience and the country itself just jumped out at me and left me intrigued and yearning to learn more. This is a country that rejects Gross Domestic Product (GDP) as a means to measure progress and concentrates on the spiritual, social, physical and environmental health and wellbeing of its people and environment. Erm…..you might want to go back and re-read that sentence again…pretty cool, huh ? Bhutan is definitely in the minority (sadly) when it comes to effectualising this type of governance and it is all done through GNH. Back in the 1970’s the fourth King of Bhutan introduced GNH which was embraced by the country and in later years (2008) it became official public policy. 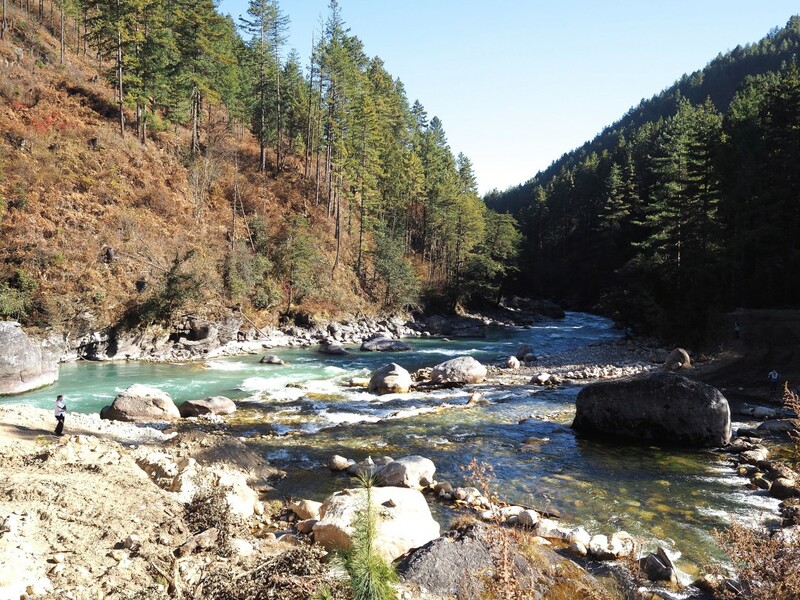 GNH is used as a way to measure happiness through prioritising preservation and promotion of cultural values, conservation of the natural environment, sustainable development and good governance. This is further evaluated by looking at things like: community vitality, health, education, time-use, psychological wellbeing, cultural resilience, environment, good governance and living standards. So….is this what happiness looks like? Now that I’ve been to Bhutan and i’ve submersed myself into their culture, I would say yes! Having a balanced approach to life whilst trying our best to tackle global, national and individual challenges seems somewhat obvious now but in our society is not something that is practiced on a higher level. I was lucky enough to be a part of the first ever Slow change Experience in Bhutan. The program was designed by the GNH Centre, Bhutan, Humankind Enterprises and Digital Storytellers to provide 20 young innovators with an immersive experience of positive development and deep understanding to enable them to bring back change to their own local communities and implement mindful solutions to their needs. Along with this the daily practices and experiences really helped me do a lot of ‘inner-work’ which was confronting but extremely healing and this was a REALLY big deal for me. We explored the GNH model, ‘inner-vation’, and social innovation through the practice of mindfulness, storytelling and wellbeing. This concept was fuelled by the realisation that ‘deep rooted social change isn’t going to happen top down, or even bottom up. We need to change from the inside out. Social change is driven by human change.’ Reminding ourselves of what we are truly seeking and what it means to adopt ‘social innovation’. There were no two days the same on the program but typically we took part in meditation, group storytelling, mindful eating, mindful walking, lectures and teachings of GNH and mindfulness from incredibly inspiring people. We went to local craft markets and explored the community values in Bhutan. We engaged in taking footage to make videos for Digital Storytellers (which I’m still working on BTW – it will be with you soon!) and we enjoyed all of our meals together as a group often coupled with our reflections of the day and positive (and sometimes negative) feelings that might have been brought up. We visited a gorgeous school in Bumthang and enjoyed a LOT of time outside with nature (my happy place). This is just a snippet of the experience and I wish I could have taken you all with me to truly understand how special and awe-inspiring the country is, the people are and the awesome friends for life that I made. Something that I really love about Bhutan and the GNH model is that it looks at ‘happiness’ in a completely different way to what you expect. It looks at the country and governance in a holistic way, factoring in environmental issues such as climate change and pollution, looking at cultural issues such as health and education, promoting good governance and policy making and trying to find sustainable development proposals to implement into the country. It gave me the opportunity to do some ‘inner-work’ so that I can start realising what my core values are again, so that I can start enjoying the ‘present moment’ and to manifest my values enabling me to serve others in a positive way. Wow…there is so much to take away and I think I will be feeding you bits from this experience for a very long time! So…on that note I am planning many more mindfulness posts for 2017, lots of awesome collaborations and also the opportunity for you to come on my mindful journey with me (and hopefully i will inspire some of you to adopt mindfulness in the same way). 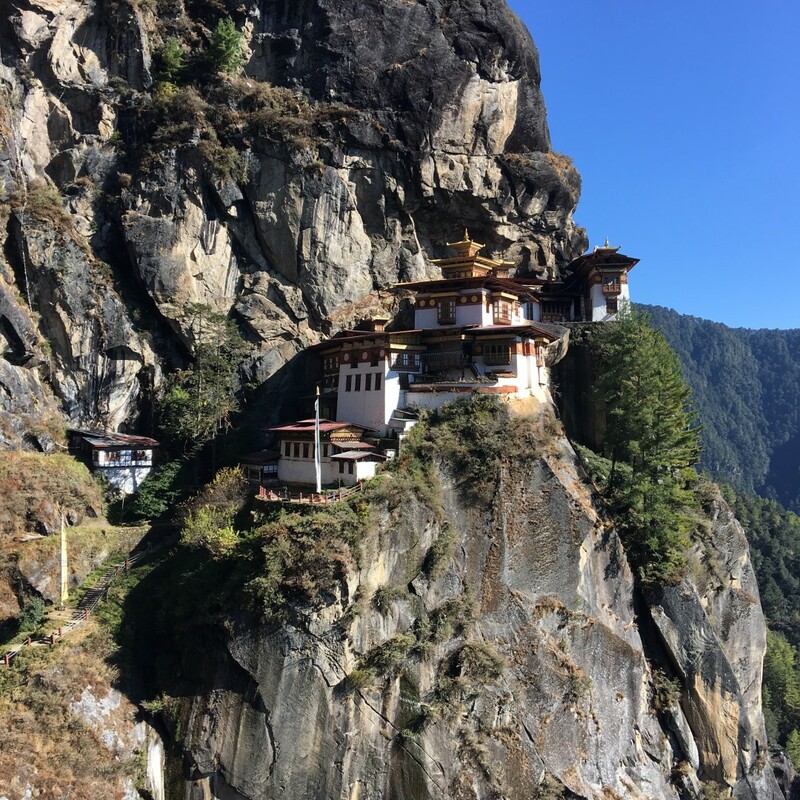 I just wanted to leave you with a very special Bhutanese story and is something that I learnt on my pilgrimage to ‘Taktsang’ Tigers Nest on my last day of the experience. Tigers Nest is located in Paro and is a sacred temple site. Although the temple was built in 1692 by Tenzin Rabgye (the Paro Penlop) it was built as a commemorative site for Guru Padmasambhav (or Guru Rinpoche) who is said to have meditated there. Padmasambhav was a renowned and learned tantric saint from northern India and in the middle of the eighth century the Tibetan King ‘Trisong Detsen’ invited Padmasambhav, the lotus-born tantric master to Tibet. He remained there for fifty years founding monasteries and teaching the tantra doctrine. According to legend, Padmasambhav flew to ‘Taktsang’ as the fiery Dorje Drolo (one of his eight manifestations) on the back of a tigress, a form assumed to subdue the local demon, Singye Samdrup. An alternative legend states that ‘Yeshe Tsogyal’ willingly became a disciple for Guru Rinpoche in Tibet. She transformed into a tigress and carried the Guru on her back from Tibet to the present location of Taktsang in Bhutan. In one of the caves there Guru Rinpoche then performed meditation and emerged in eight incarnated manifestations and the place became holy. He established Buddhism and the Nyingmapa school of Mahayana Buddhism in Bhutan and has been considered the ‘protector saint of Bhutan’. Since then many Tibetan saints and eminent figures came to Taktsang to meditate. I feel so lucky to have gone to this sacred place and I really can’t put into words how special and spiritual it really is. I was lucky enough to be blessed by one of the monks there with holy water placed into my hands for my mouth and crown of my head and I spent a good amount of time with my Bhutanese friends inside each of the beautiful temples praying and meditating. It’s such a quiet place and really allows for peace and contemplation and even as a budding photographer I didn’t feel disappointed at the ‘no camera’s allowed’ rule. This is definitely a place to be enjoyed in the present moment with no distraction and garners the individuals full attention. Such a wise and inspiring story, Sophie. Looking forward to more as your Bhutanese experience continues to germinate within your heart. Will be very interested to hear how you integrate what you’ve learnt into daily life in Australia. Wishing you much happiness. Thanks Aleta…I’m so glad my story resonates with you. I feel like Bhutan really has touched my heart in a deep and special way and I’m excited to see how that unravels for myself and also through my blog to my readers. Lots of love, light and happiness to you too, Sophie. Hi sophie! I loved reading what you observed at Bhutan. A bunch of us (changemakers) are headed there, mostly for a different perspective of the world than anything else, and seeing how it miight impact the future of what we go on to build in India. We’d love some input on anything you’d like to tell us. Some must trys, or life changing experiences, or your company even 🙂 we head late feb -ish ..